did you enabled retina and still get 0	-137.8133392334	640	1114.8800048828 ? That's strange, I did not get a X device, can you test it on simulator? the contentScaleFactor is always 1 in OSX? Ahh, maybe, those defines are misleading. maybe it should rather be TARGET_OS_MAC. TARGET_OS_OSX is only defined for native OSX builds (which don't have the notion of scale factor). 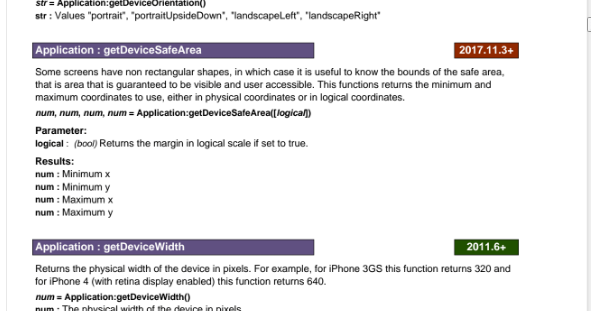 It is not defined for iOS simulator. Then I do not know why the result value on simulator is just the same as no scale is performed. Checked on simulator, I get the same results as on my real device (that is: working). But I did my test on a player (faster), maybe it is a problem with non-player apps ? If you are in the final app (non player) scenario, can you try to delay your query by one frame (not main initialization code), or check it after APPLICATION_RESIZE events ? Hi hgy29, just confirming that it was the one in the Players folder. I guess I always assumed that's the latest and build/push out to my devices when an update comes out. Although, I had to manually copy about 20 files from the plugins folder to get it to compile. Are there instructions for building a custom player from the studio? I've only ever exported projects, not a blank player I can push to that contains many projects. does TextField:setLayout work for you on 2017.11.3? @pie Double check your player version number. a blog post about what happened during this year with gideros would be nice. I could make the program do a pass at a pdf based on date of api. It would only cover new commands - not ones that have been updated, unless we add another field to the help database.